When Mary wrote her article, these threads were not easily accessible here in the United States, but that is changing. Needle in a Haystack in California is starting to stock this thread in ten colors and several sizes. Needle in a Haystack is planning a club in 2018 so that folks can get a range of Au Ver a Soie metallic shades (more than what will be available on their website) in sizes 4 and 8. Stay tuned for more information about this. Bedecked and Beadazzled has some colors of the Au Ver a Soie metallic, too. A friend sent me a spool of the 002 gold in size 12 recently. It's not listed on the shop website yet so you will have to email Ruth and ask her what she has available. I decided I would use this on my current project so I could review it here for you. 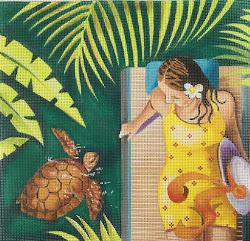 Mary's review is fabulous but then she does surface embroidery, so her problems with working with a metallic thread are different than what I run into as I needlepoint. In the photo at the top of this article, I used Kreinik's size 16 braid in the border on the left and the AVAS metallic in the flower pistils. See any difference? My first question was whether my size 12 AVAS metallic braid was the same diameter as Kreinik's size 12? I pulled out a spool of the size 12 Kreinik and compared it to the AVAS. The answer is yes, sort of. On the spool they are about the same, but the AVAS metallic braid is softer and will squish more if you have a tight tension. Kreinik's braids are stiffer and will not compress much even if you really pull hard on them. Does the AVAS fray at the ends as you stitch? When you cut a length off the ten meter spool, the end doesn't unravel but as you handle and stitch with it, the ends open up a bit but not enough that it is going to annoy you. If you like to stitch down to the last inch of a thread before tying off you will be able to with AVAS. 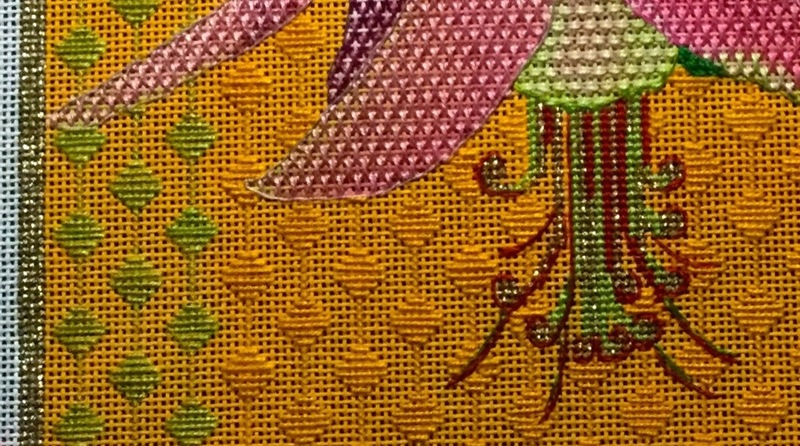 My project had quite a bit of gold on it so I used both Kreinik's 002 and AVAS's 002 metallic in tent stitches in several areas. The AVAS gold is more brassy in color and the metallic look seems a bit more muted to me. But really there's not much difference when you are doing tent stitching. 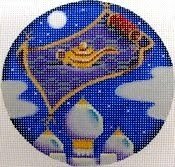 The Kreinik is certainly a little fatter, which you would expect. 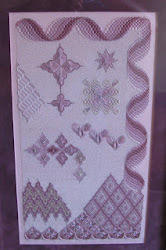 But this worked well for my project as I used Kreinik for the border where I wanted a slightly more raised tent stitch. The AVAS on the pistils was more muted in color and less prominent which is perfect for the look I wanted. I think AVAS metallic braid will shine when you are doing surface embroidery, particularly in a braided stitch. Kreinik is a stiffer thread so something like Van Dyke stitch is going to be harder to create in Kreinik than it would be in AVAS. Think about doing a line of braid on Santa's outfit. The Kreinik will be less bendable. It will work, for sure, but the AVAS will bend easier. If you have ever complained about Kreinik being too stiff and don't mind the slightly less metallic effect that AVAS gives, it's worth tracking down some of the AVAS metallic braid and trying it. 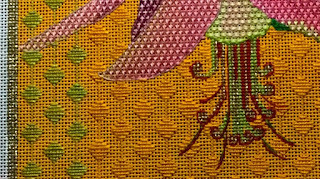 I liked it a lot and if I had a lot of French knots to be done in metallic thread in my future, I would order the AVAS metallic to use for them rather than trying to stitch them with Kreinik. Still, Kreinik's range of colors and availability mean it is my Go To metallic thread. Aren't we lucky to have these choices?! © Copyright September 21, 2017 Jane M. Wood. All rights reserved.